I’ve been painting legions of Imperial Romans for the Hail Caesar miniatures war game. These are 28mm miniatures, about the height of a AUD 50c coin. I have completed a number of units. I think they have turned out alright. Originally I used the transfers for the shields but then reverted to using a base red for the shields and leaving off the shield insignia. In my opinion it helps to achieve that sea of red that I am looking for on the battle field. Here are some shots. I also have painted up some Praetorians, veterans, auxiliaries, a scorpion and some cavalry. Photos of these to come, although you can see the Pretorians in the rear of this first photo. These Romans have taken me some time to paint, as I have worked slowly at it over the past few years. I recently planned to have a game of Axis and Allies (Spring 1942 Version 2) over the Christmas break with some fellow gamers – one of whom was arriving from interstate, and so I grabbed the game from the cupboard, dusted off the box and laid the board out on my billiard table, thinking this would make for a great playing field – plenty of room for the four of us to stand around the board, discuss strategies and make battle. Yet the board looked rather small sitting there in the middle of the billiard table which is 10 feet x 5 feet). I thought to myself ‘how good would it be to have a Giant Axis & Allies board, one that fits the size of the billiard table’. We were playing in two days time so I had to get to work if I was going to make this happen. Original board laying on top of the giant board. The giant board is 2.1 metres x 1.2 metres. Same amount of pieces on the original board (left) as on the giant board (right) for Western United States. No longer cramped! First, with a simple search on Google, I found that the board that I have in my Axis & Allies set was already scanned onto the net. So I copied the image into photoshop and then enlarged it so that it was 1.2 x 2.1 metres in size ( a size I had determined would fit nicely on the billiard table) – a large file! The image was blurry at this size, however this was okay because I then redrew the whole board using the original image merely as a guide. The board that I have in my set is the dark board with the almost blackish water and dark brown,grey land. Personally I don’t enjoy this board’s colours and have often thought of buying the later version with the more earthy coloured land masses and blue seas. So I changed the colours on my giant board to greens and brown for land and blue for the oceans. I then added sea and ocean names that are not on the original board, and also continent titles – Europe, Asia, North America etc. The professional contact finish makes the board smooth as silk. Giant Axis & Allies board close up. Sea names not found on the original board have been added. Another feature I included that is not on the original board is setup symbols. On each land space that requires pieces for the start of the game I then added the appropriate symbols. This makes setup so much easier. It took me approximately 18 hours to recreate the board in photoshop. It could probably be done much quicker, however, I’m a bit of perfectionist when it comes to these sort of things. The next morning I made some phone calls to 6 different signage companies who do print on demand and ‘one offs’. Each was on on holidays (it being the period between Christmas Day and New Years). The 7th company I rang were situated miles away, across the other side of the city, yet I gave them a call anyway. So glad I did. The gentleman happened to be doing some work that day and when I told him what I needed and that it needed to be ready the following day, he said he would do it! He did the job, printed, finished and delivered it the afternoon of the day before we were to play. The board is professionally printed, mounted on 5cm armour board and coated with a protective contact. It is incredibly smooth and durable. The printer did an amazing job and it was a terrific surprise for my fellow gamers when the arrived to see the giant board awaiting on the billiard table. The game was played with zest and was very enjoyable, however we ran out of time and so there was no victory outcome, although the Allies definitely had the upper hand. When the game is not being played I store the board on my study wall. It is affixed with mounts that keep it flush and stable, but also allow for quick removal ready for the next big game! For others wanting to create their own giant Axis & Allies board, there are some good posts on gaming forums that describe how one can do this. Please do not ask me for the photoshop file. I will not be giving this out or selling it as this would breach the intellectual property rights of the game developer. This board I created purely for personal use … and it makes Axis & Allies (already a magnificent game) even more enjoyable. Being so busy with other parts of my life I haven’t got into the hobby shed lately and so I thought I might post a few photos of some work I did A few years back, when I took some time to paint up a Skaven army from the Warhammer range of miniatures. For those who do not know Warhammer, the Skaven army is an army of rodent creatures (rat men). I had always wanted to paint some of these miniatures, however, I must admit I struggled with these as the detail is so fine. I now have a huge respect for the artists who can paint these miniatures with such perfection. I do not own these miniatures anymore as I do not play the game, and so I sold them a while back, but thought I would share my efforts. 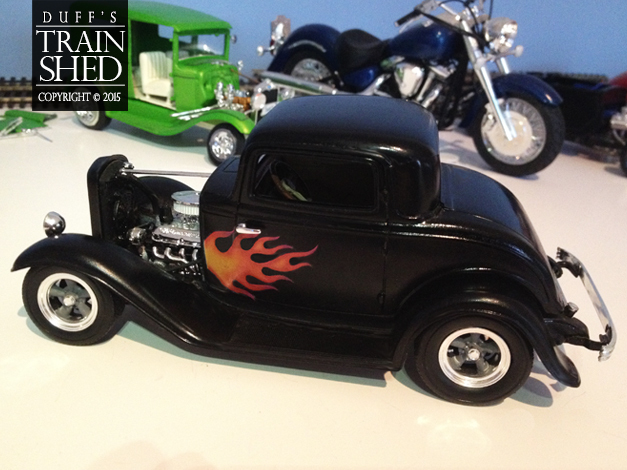 ’41 Willy’s Street Rod completed! 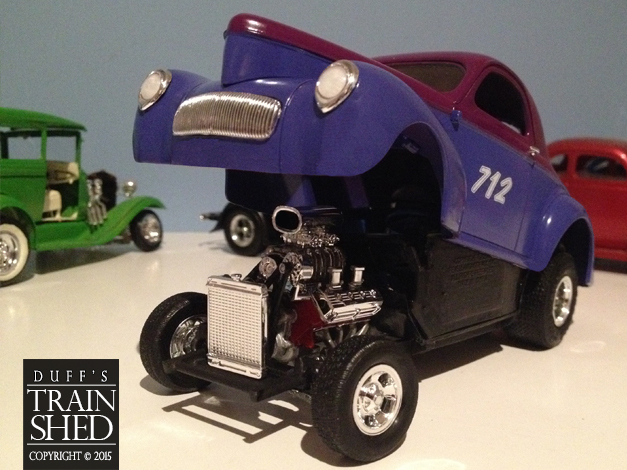 I Finally got around to completing my ’41 Willys Street Rod. Chrome pieces, headlights, tail lights, windscreen, rear window and decals all added. I am pretty happy with the finish. I like the colours I chose and think it has turned out alright for my first two tone job. There are some areas that could have been done better around the trunk and bonnet grooves, but its fairly small stuff, an overall I am pleased. The full build is available here. 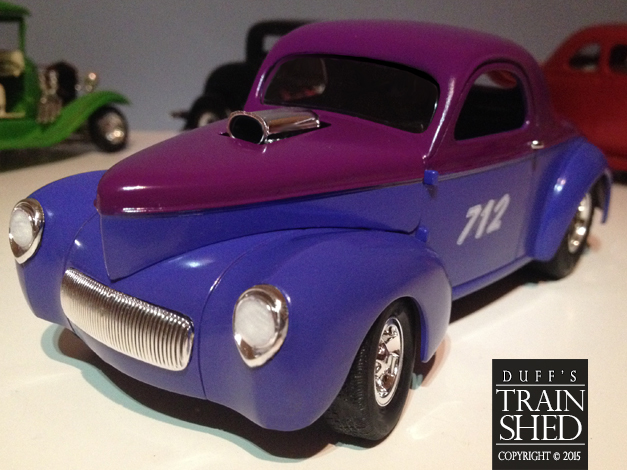 Author DuffPosted on 11 March 2015 15 March 2015 Categories Hot rodsTags '41 Willys, Bonnet Scoop, chrome, good guys, hot rod, street rod, Willys Coupe2 Comments on ’41 Willy’s Street Rod completed! 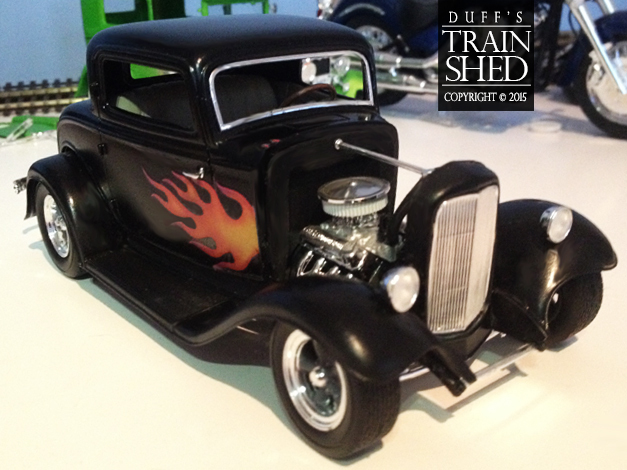 I received an email from a gentleman who was keen to see more of the Ford Coupe with the flames, which could be seen in the background of one of the 41 Willys Street Rod build photos. 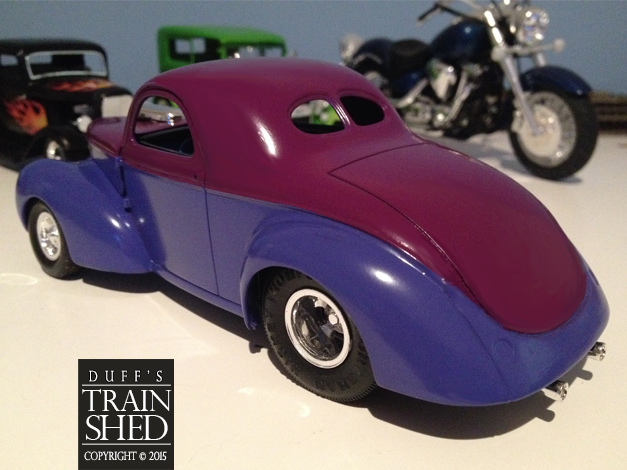 The Ford coupe was one of my first street rod builds and I had no intentions of running a post on this model, as I have always felt that the finish was pretty average, however, here it is, Jason – the 1932 Ford Coupe Street Rod. This was the Revell Good Guys kit, and the only mods I made to it, were using smaller head lamps without the cross bar. You may also note that the left hand door handle, in the last photo, is not from a ’32 Ford Coupe. I lost the original and had to improvise. 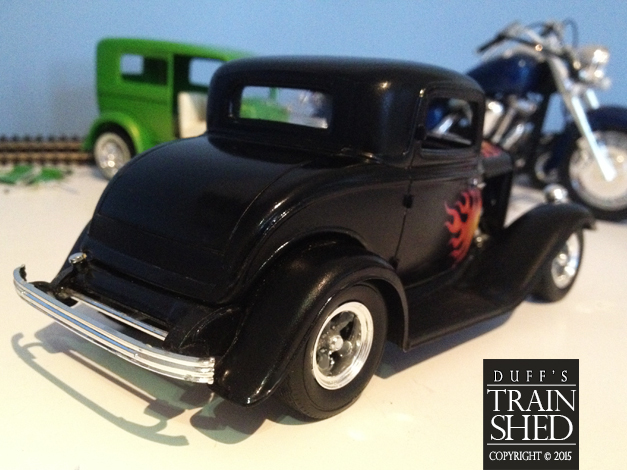 ’32 Ford 3 window coupe – front view with hood. 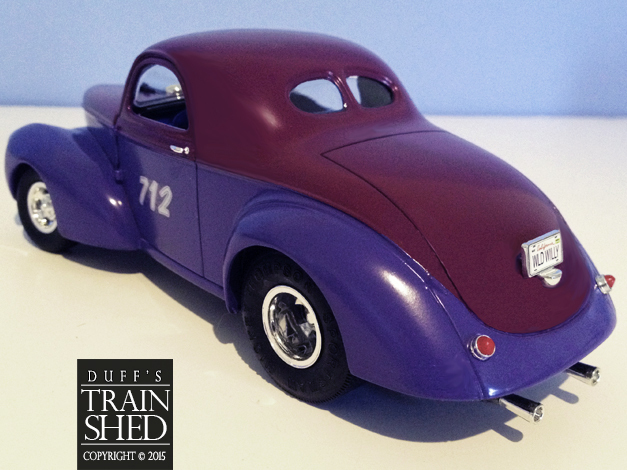 ’32 Ford 3 window coupe – rear view. 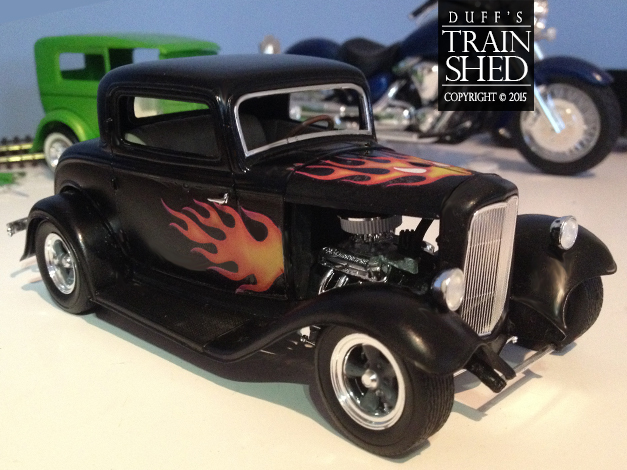 ’32 Ford 3 window coupe – hood off. 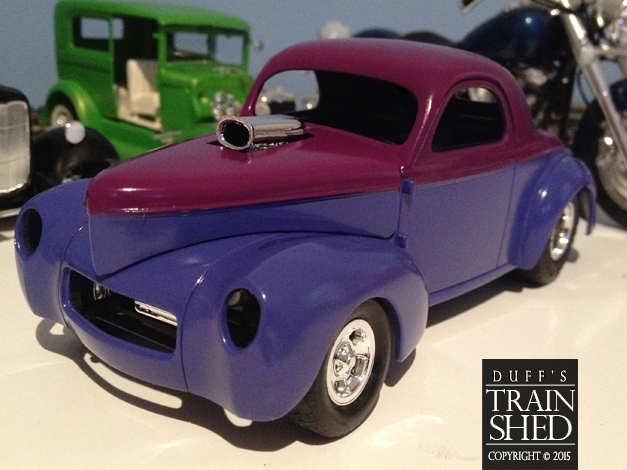 ’32 Ford 3 window coupe – side view without hood – note the non standard door handle. 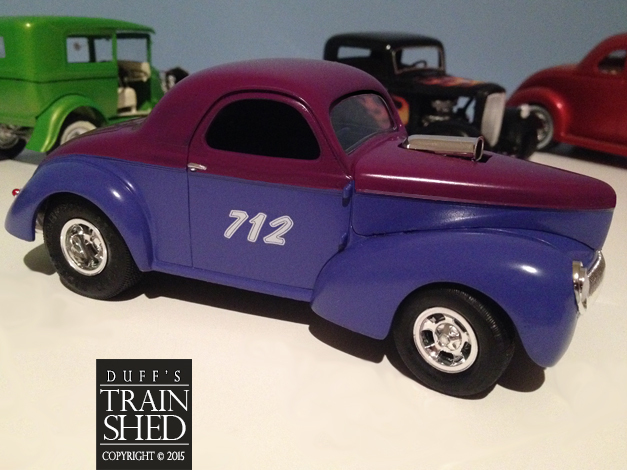 Earlier this week I was rummaging about in the garage (during a somewhat middling attempt at tidying it), and I happened upon a Revell Goodguys 1941 Willys Street Rod model kit (produced in 2005) that I had purchased a few years back. Dusting it off, I took it into the train shed and set about constructing the first few stages. 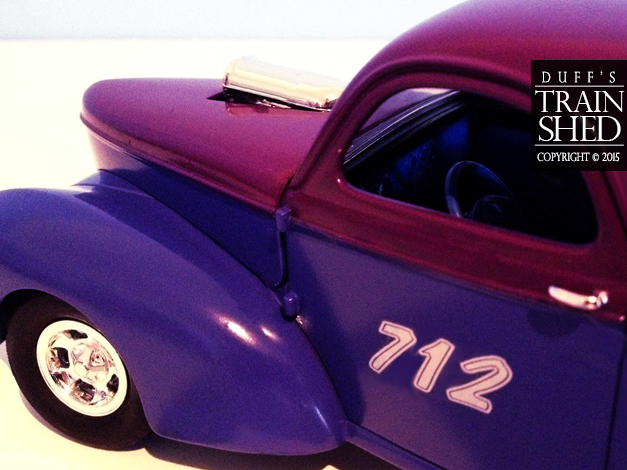 According to Revell, the 1941 Willys is one of the greatest ironies of the automobile industry. A car that was never very popular in its day, and yet nowadays, the little coupe is a fixture at every street rod show across the USA. Thanks to its good looking lightweight body and frame, the Willys has become a classic on the American automotive scene. Thought I would share a few shots of how my model it is coming along. 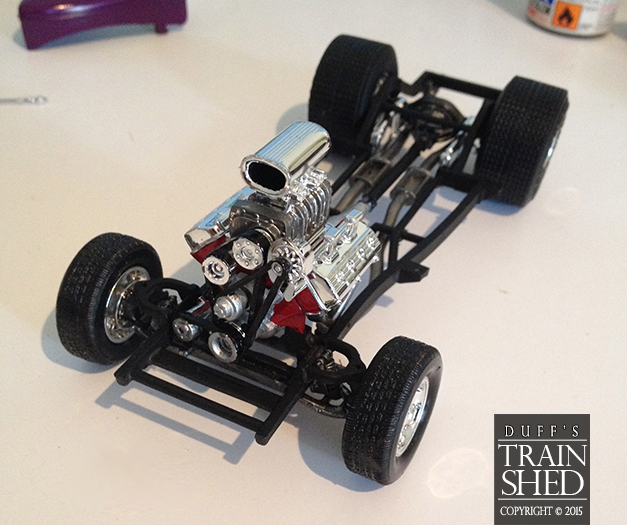 Engine assembled on frame and linked to rear axle, with springs, suspension wheels and tyres fitted. Close up of the supercharged V8 motor. 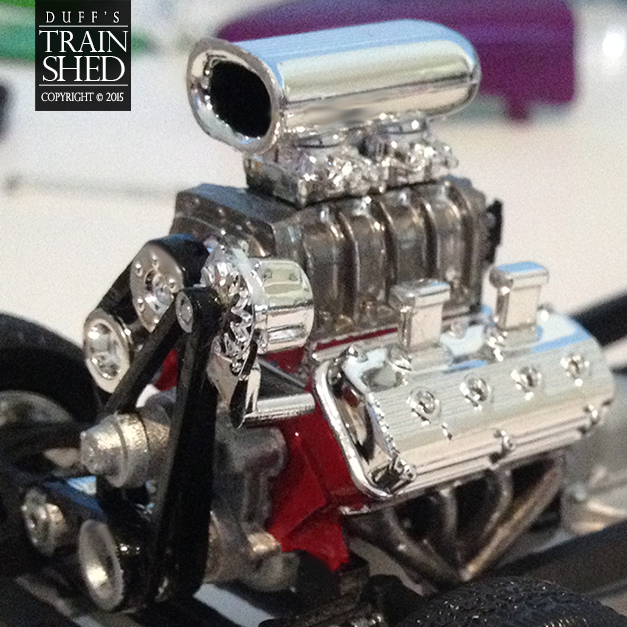 Wondering if I should have painted the carburettor aluminium. Fan belts need a coat of matt too. Chose purple for the body. May mix it up a bit yet later on. 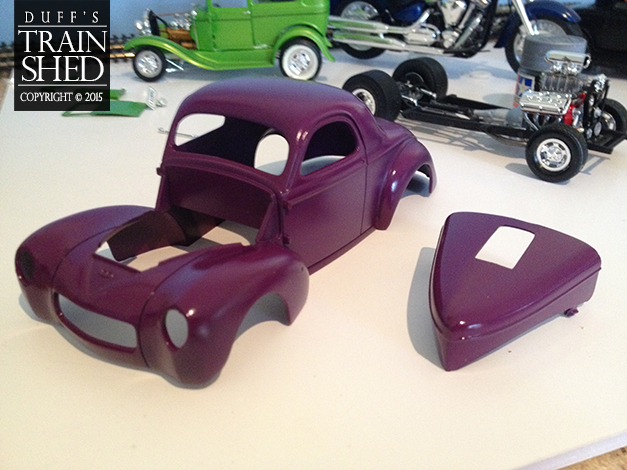 This is four coats of Tamiya TS-37 Lavender. Happy so far with how it is looking. Hope to post again soon on my progress. 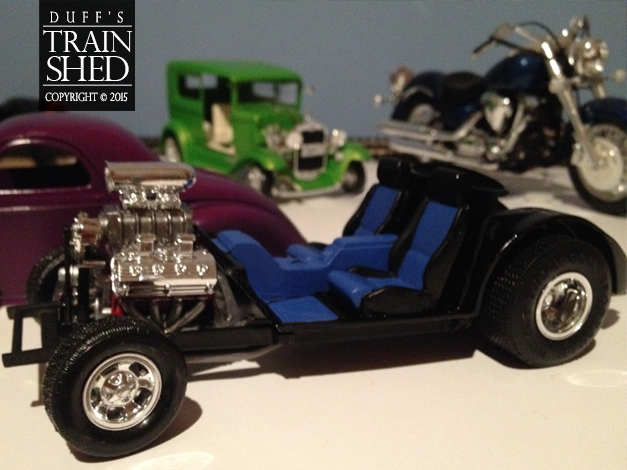 Began work on the rod’s interior. I began with a maroon colour, but was not happy with the result, and so switched to a blue. This is the Citadel Ultramarine blue with a semi gloss black. Citadel Ultramarine Blue and Tamiya Semi Gloss Black Trim. 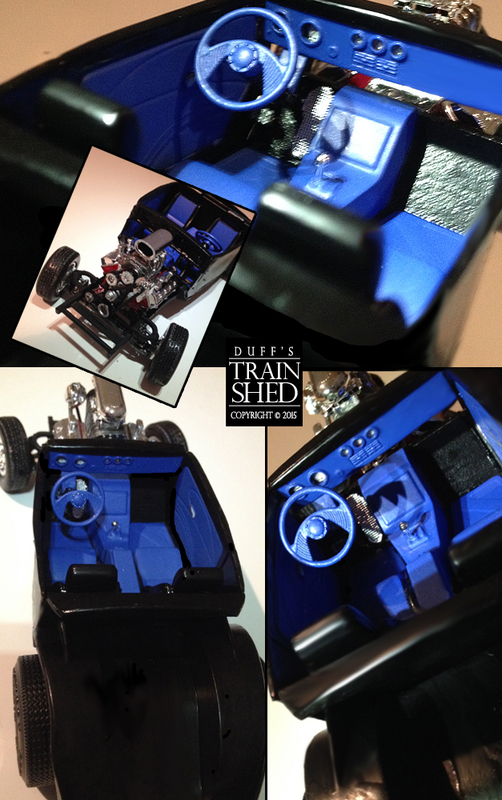 Work on the interior and the trim is completed, although I may scratch-building a roll cage and some seat belts. I’ll see how I go with time. Completed interior. 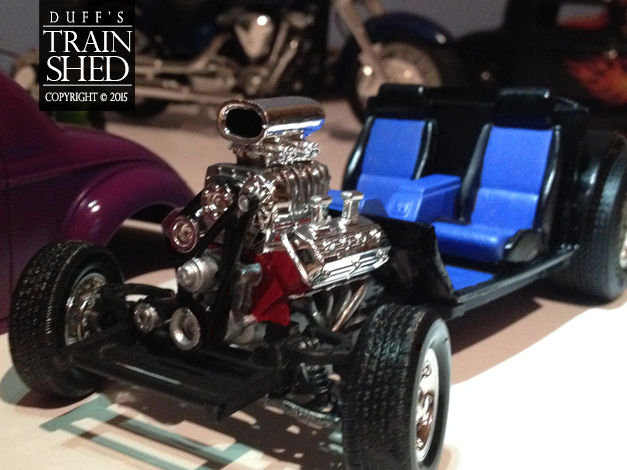 Quite happy with the results, especially the white dials, the chrome stick-shift and chrome accelerator. It was difficult to get closer up shots using my cruddy camera, without the photographs blurring. 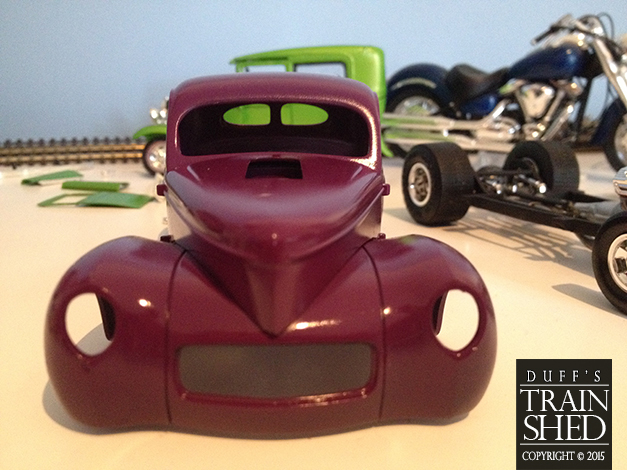 Spray painted the second tone for the body work, using a Tamiya Blue Voilet TS-57 – three coats. 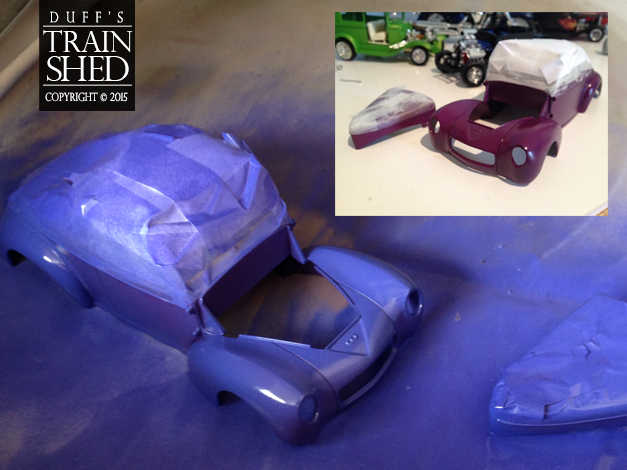 Bodywork taped up and then the Tamiya Blue Violet applied – showing first coat of three. 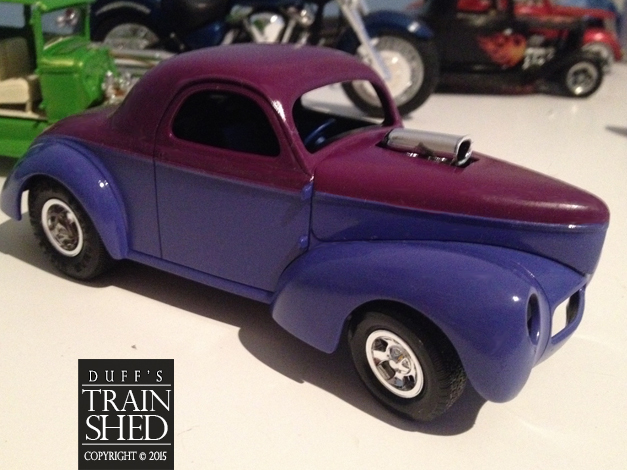 Two tone ’41 Willy Street Rod – Undercoats applied – Lavender top – Violet Blue bottom. Undercoats applied – Chrome fittings, decals and gloss top coat still to be applied. 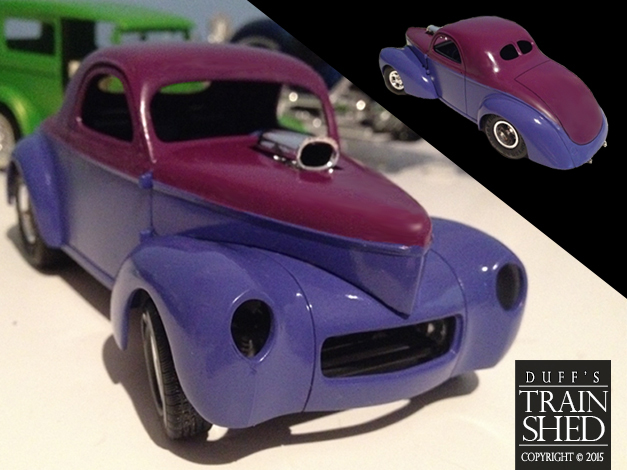 Finally got back to the ’41 Willy and gave it a final coat of each colour and then two coats of Tamiya semi-gloss for that shine. The car is all ready now for Chrome fittings and decals. I’m fairly happy with the result. There are a few small areas that could have been done better around the boot line that had to be touched up. Final coat + semi gloss x 2 coats applied – Ready for chrome fittings and decals.